We live in a time where it is so easy to take pictures wherever you are – you just need to pull out your phone and push a button. And so many people take selfies these days in all sorts of places – not just in front of a nice view but also in places like their car, the bar bathroom, and their kitchen. This makes it easier than ever for things to go hilariously wrong in the background of a photo. From photobombs to unfortunate reflections to animals acting up, we think these crazy backgrounds make the photographs so much better. If you think about it, we can something take for granted the different things that go on in the background while we take pictures. We try to make sure our smiles are perfect, that our hair isn’t windswept, and that the lighting is just right. But what makes a picture extends beyond just those things. It lends itself to the beauty of our fellow neighbors appreciating us as we take our photos. Here are some of our favorite photos where the background steals the scene. Have you ever noticed how people on the subway tend to mind their own business, trying to avoid making eye-contact with strangers? These girls are certainly doing that, taking a selfie in their own world, enjoying a night out on the town. They’re looking their best, dressed in black with their makeup and hair done, and they’re feeling good. But what they failed to notice (maybe because those sunglasses make it hard to see) was that the woman behind them definitely wasn’t feeling quite as great as them. We’ve all been photobombed at least once in our lives, when we think we’re taking an Instagram worthy selfie but suddenly notice an unexpected presence in the background. Usually, it’s just our little brother or annoying friend, but these girls were photobombed by something much more sinister. They were just trying to take a cute selfie together when they abruptly realized there was a third figure in the picture – and not a welcome one. Outdoor concerts can be a lot of fun in the summer – you get to sit outside and enjoy your favorite songs. But you never know who you’ll run into at such events, since apparently anyone can show up, even the Dark Lord. The girls in this picture were taking a selfie when they noticed something strange behind them: Lord Voldemort himself was sitting on the grass. We don’t know what band was playing that day, but we do wonder what kind of taste You-Know-Who has in music. The first thing we noticed when we looked at this picture was the unbelievable mess all over the floor of the room. Then we shifted our gaze and realized that there is actually a girl taking a selfie in the foreground of the photo. She is dressed up and posing, clearly trying for the perfect shot, almost as if she doesn’t notice what’s going on in the room behind her. We truly don’t know how a room can get this messy but it looks like it’s time to clean up. Ah, the bathroom selfie, a classic way to demonstrate that you’re out having a good time and looking your best. There are often good mirrors and lighting in the restroom, and you can get the shot right after you finish touching up your makeup. But sometimes, mirrors can reflect more than expected – first we noticed a leg sticking out from under the door of the stall, and then we realized that there’s a woman lying on the floor! We laughed, but hope she’s okay. Mothers and daughters frequently have different ideas about what is acceptable. This girl, for example, thought it would be a good idea to take a selfie in a dressing room, in a very tight and short dress (or is it a shirt?). Her mother, however, didn’t approve. There’s mom, captured in the selfie, poking her head through the door and making a very disapproving face. Watch out girl, she looks like she might be angry enough to ground you! 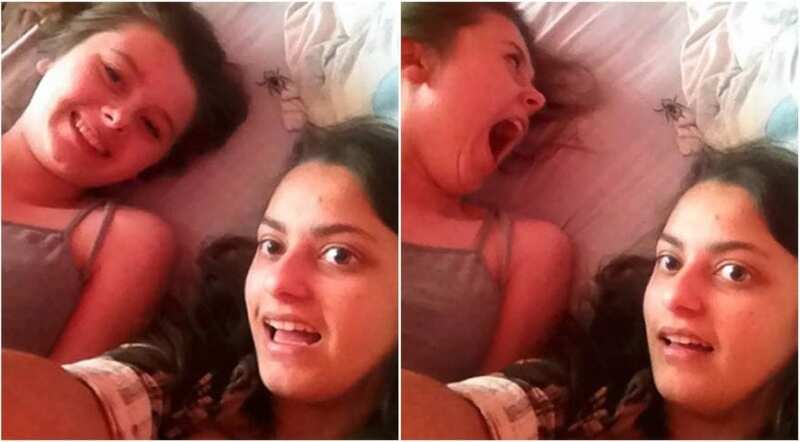 Some people simply can’t resist the temptation to ruin other people’s selfies. Take this guy, for instance. He saw a young girl taking a selfie in the car, holding up a peace sign and making a pretty standard selfie face. So he jumped right in, ruining (or possibly improving?) the picture, making a very different sign with his hand. We understand, sometimes you see an opportunity and you simply have to take it, but it’s not nice to ruin other people’s photos. At least she can always take another one. 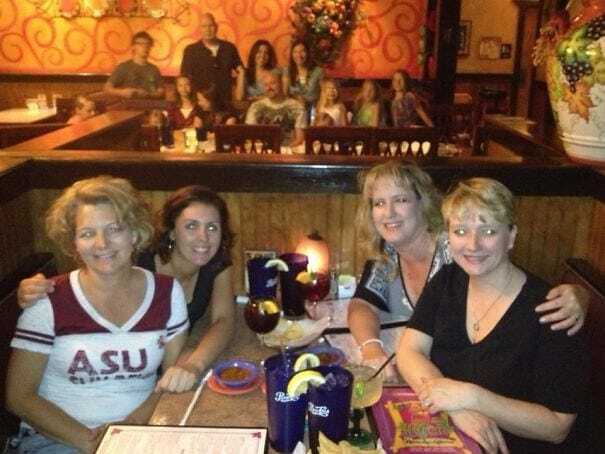 It’s known that girls often go to the bathroom together when they’re out at a restaurant or bar. And usually, they have a sort of unspoken code, a way that they look out for each other, perhaps standing guard by the door, while their friend is doing their business. This girl disregarded that completely, not only taking a selfie in the mirror while her friend was still on the pot, but also invading her privacy completely. It’s funny, but yikes, we wouldn’t want to be caught in this situation! 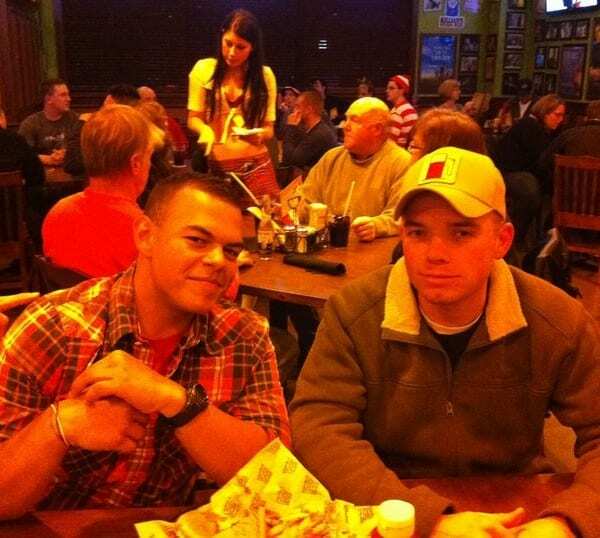 Sometimes people intentionally photobomb other people’s pictures, and sometimes it happens completely by accident. This photo appears to be the latter. 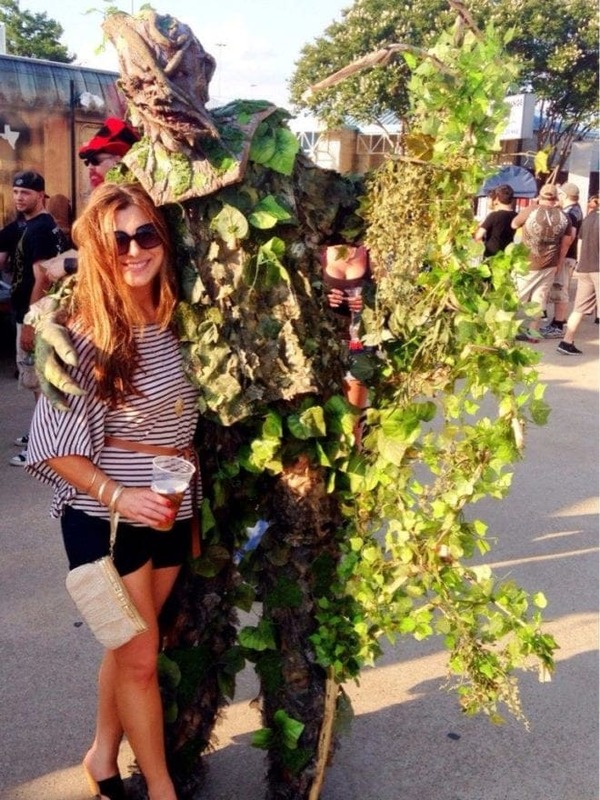 A girl at some sort of event posed for a picture with her drink and a very tall and sinister looking tree person. The branches, however, very clearly framed another woman’s torso in the background, cutting off her head and legs but leaving a very clear view of her midsection. It makes for a very weird yet hilarious picture. Baby selfies are always adorable and funny, even without crazy backgrounds. This dad wanted a photo with his little kid, who is making just the cutest face ever, and he probably didn’t look behind him before capturing the shot. His dog just happened to be doing its business in the backyard right behind them. 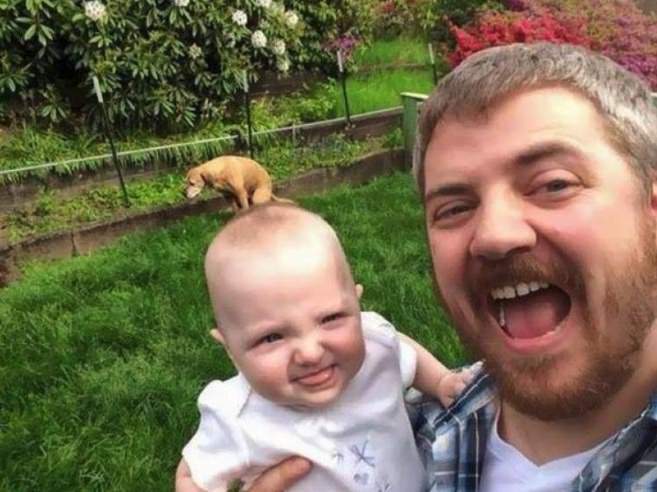 And so, thanks to very good timing, he ended up with this wonderful picture where it looks like a dog is marking its territory right on top of the baby’s head. Photographs have the ability to freeze a moment in time forever, and that’s exactly what happened here. 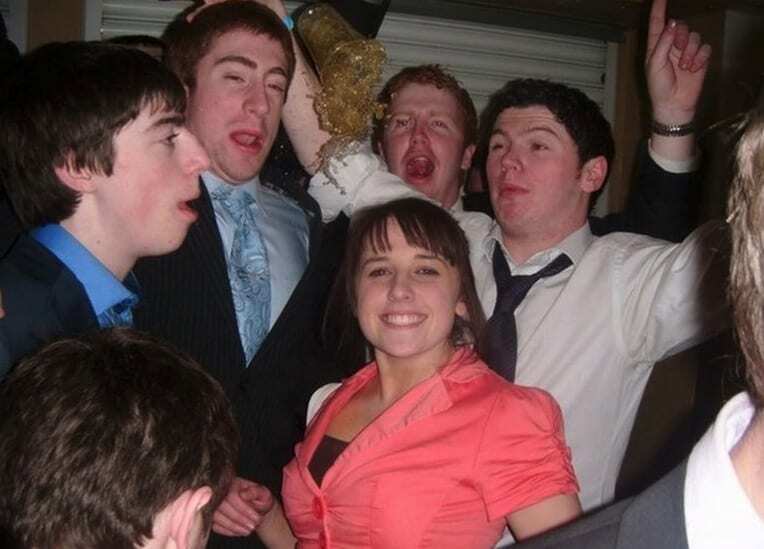 The girl in the middle is posing for a photo, unaware of the shenanigans going on around her. And somehow, someone’s cup went flying just as the photographer captured the scene. The guys all realize what is about to happen, and their looks of horror are plastered on their faces for eternity. The girl however, hasn’t caught on to what’s about to happen, so she’s just smiling happily. 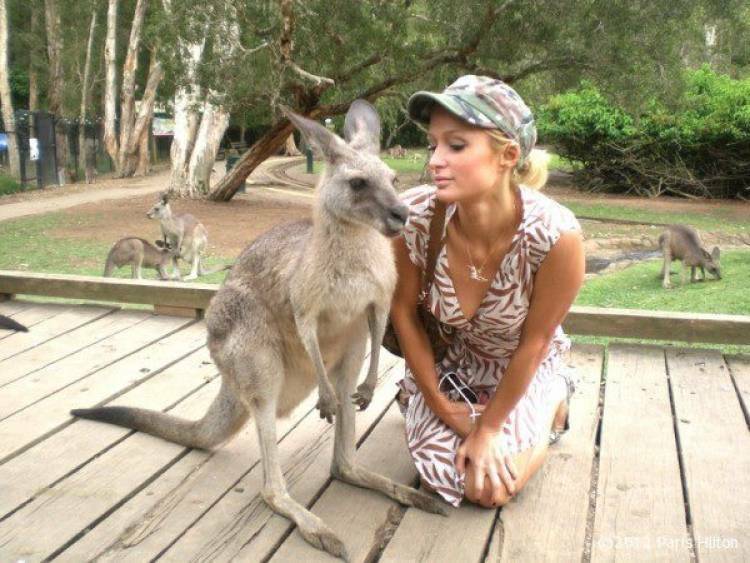 Kangaroos are arguably one of the coolest animals on the planet, so we understand why Paris Hilton wanted to get a photo with one. However, even if these kangaroos are usually around people, they’re still wild animals and do not filter their behavior when someone pulls out a camera. That explains the two kangaroos engaged in some personal behavior in the background, unintentionally stealing the show from Paris. It’s okay, Paris has plenty of opportunities to shine. It was supposed to be the ultimate romantic couple photograph, but it turned into something else entirely. 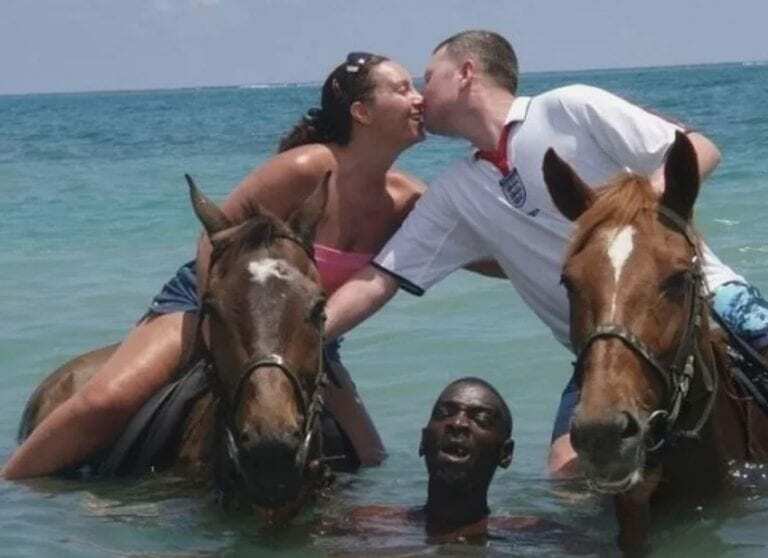 The happy couple seems to be having the time of their lives, riding horses into the beautiful blue water and posing for a photo mid-smooch to preserve the moment forever. But they look like they have forgotten about their guide, who is holding the horses still at the expense of his own safety and comfort. Someone get that guy a life preserver! If you’re a parent, your child is usually the center of attention, but there comes a time when you just want to take a selfie by yourself. 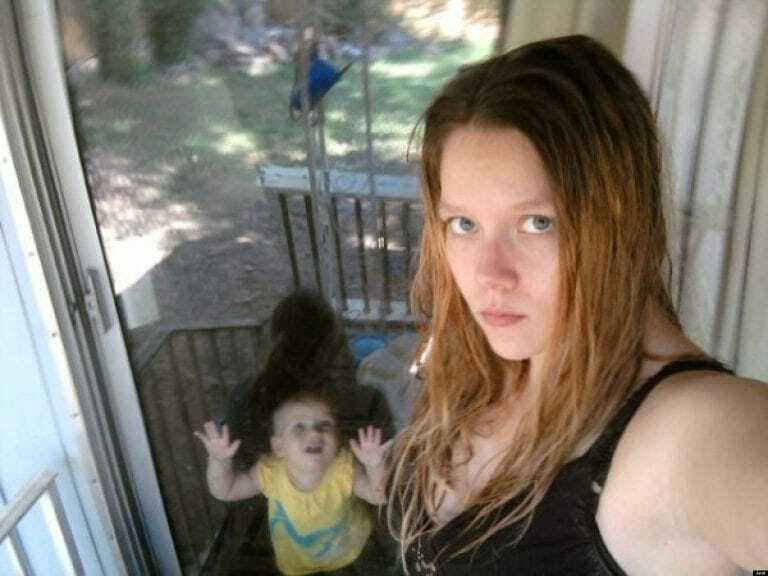 This mother went outside to try to get the most flattering shot of herself, but her child was having none of that. The little kid stood up against the door demanding mom’s attention, but somehow the reflections created a dark figure behind the child. The longer we stare at it, the less we understand what it is. Spooky! This beach really does look like the perfect setting for family vacation, with its perfect blue water and white sand. There are no waves which makes it safe for the little kids to play, too. Three generations came together to memorialize this perfect, relaxing day off, posing for a group photo. 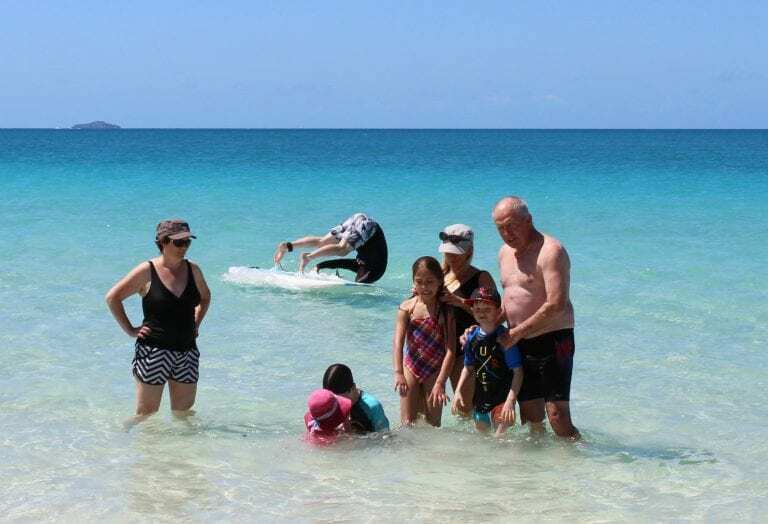 But somehow, despite the still water, the surfer in the background suddenly went head-over-heels right as picture was taken. It may not be the photo they had in mind but it makes for a funny vacation relic. 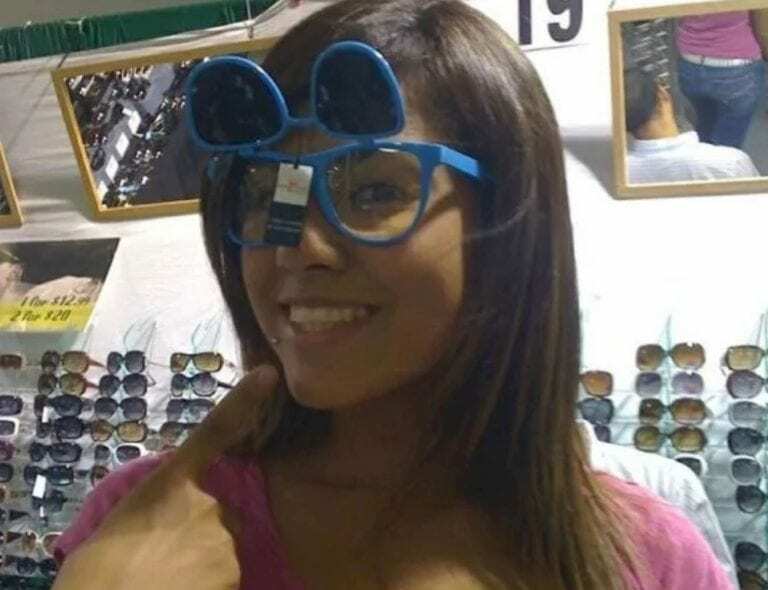 Who doesn’t occasionally take a selfie while trying on funny glasses? On first glance, this looks just like a regular harmless picture of a girl doing just that, but when you examine the picture more closely, you notice something else going on here – there’s a man standing behind her! You can see the back of his head clearly in the mirror, and it looks like he’s checking her out without her knowledge. She probably wasn’t so thrilled to see that reflection when she looked at her selfie later. We see what’s going on here. 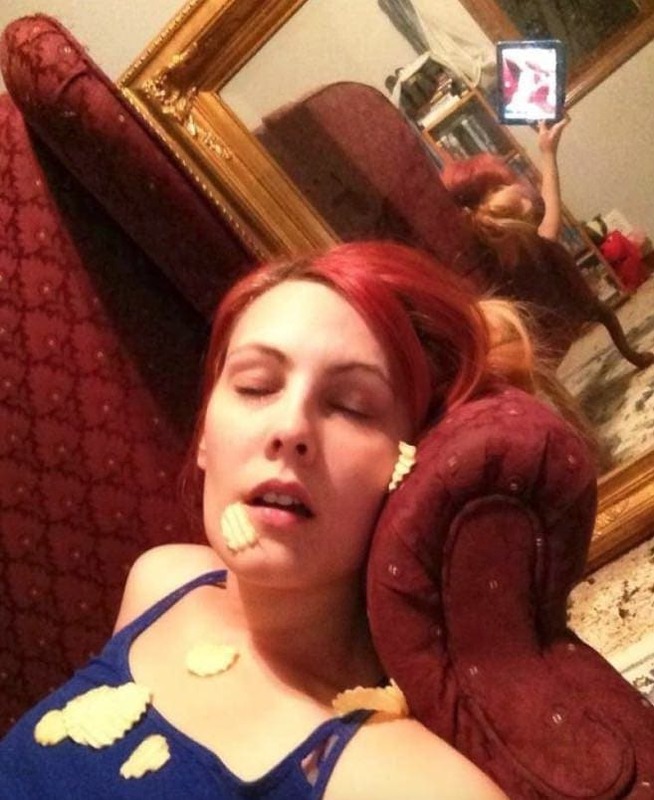 This girl was trying to feign a scene in which she fell asleep eating potato chips, but was caught in the act. 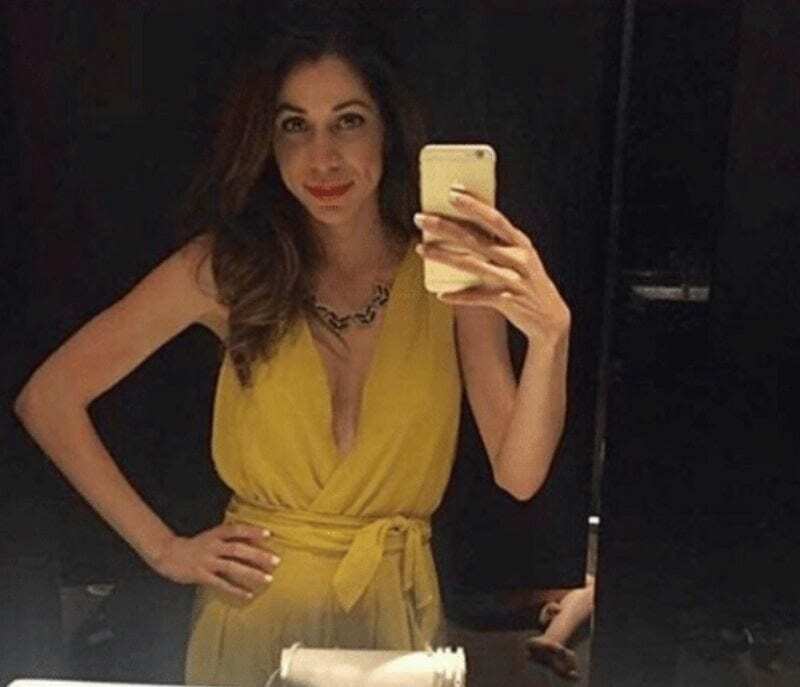 However, she failed to notice a giant mirror behind her, perhaps because her eyes were closed as she snapped the selfie, so she was caught in an entirely different embarrassing situation. The question still remains as to why she was trying to stage this scene in the first place. When a bunch of women wearing matching white bikinis gather on the beach, there must be some sort of photo shoot going on. One man, however, was going for a walk by the water and accidentally stumbled across this scene, ending up in the background of what would have otherwise been a stunning photo. Strangely enough, he doesn’t really seem to care or think that anything out of the ordinary is going on, and isn’t even looking their way. Somehow, this dog knew exactly the right moment to jump up on the window and strike a pose, just as its owner had achieved the perfect selfie posture. 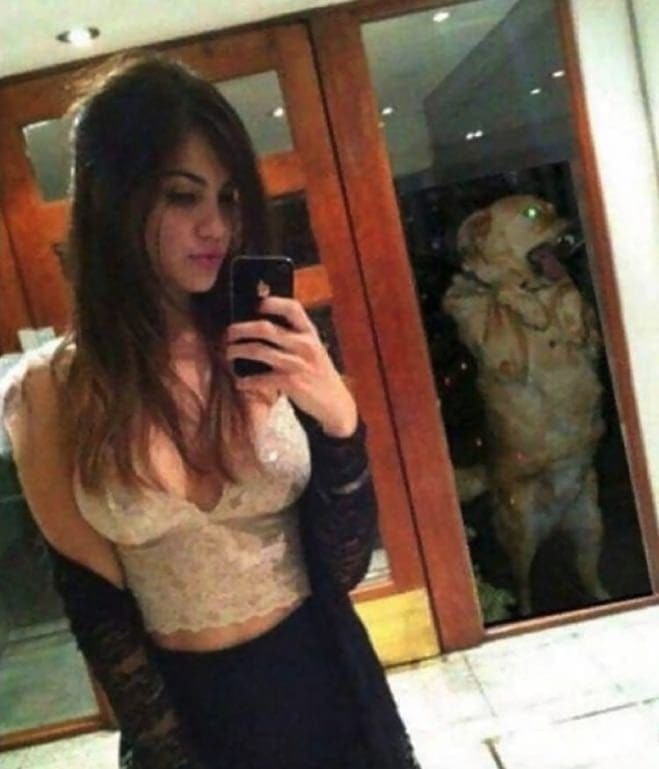 While the girl is clearly trying to look steamy in her selfie, the dog looks just like a possessed creature trying to get into the house – the flash even makes its eyes look green! It almost looks like the dog is mocking the girl’s selfie pose, but that doesn’t really seem possible, does it? Ah, a young couple in love. There’s nothing quite like falling in love for the first time, and when you do, you want to flaunt it. Perhaps that’s why this couple requested a photograph of them kissing on a bench one quiet night. However, they failed to notice that they weren’t alone in the park, and their PDA didn’t go unnoticed. There was a guy sitting nearby who just couldn’t resist the urge to make a silly face, arguably ruining the photograph, but also making it oh so much funnier. Rush hour, am I right? When you take a selfie, you can usually post it with whatever caption you want and assume that people will believe you. After all, why would you lie? That’s a good question. This girl posted a picture of herself in the car with the words “This traffic ugh” underneath. Unfortunately for her, her sunglass show a perfect reflection of the road ahead of her – and it’s completely empty! 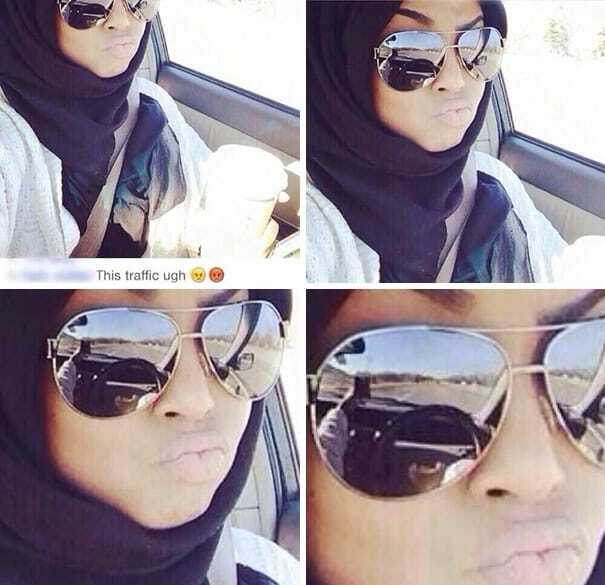 Not only is there no traffic but she’s taking a selfie while driving, and that’s dangerous. Trips to the supermarket are usually fairly uneventful and mundane. That, however, does not seem to be the case in this picture. 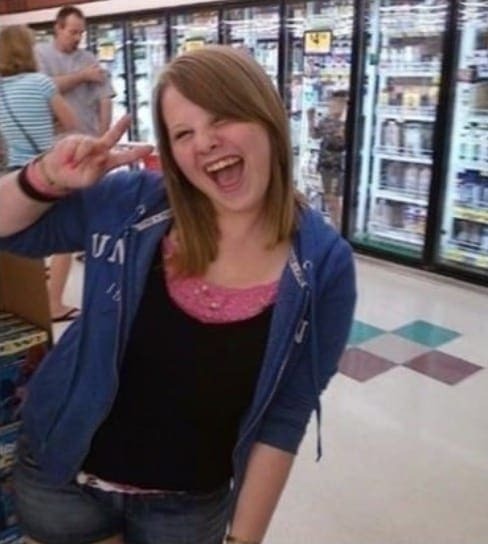 The girl looks inexplicably excited to be photographed in the supermarket, but even more surprising is what’s going on behind her: There is a child inside of the refrigerator! While we have no idea how he got in there, the excitement on this girl’s face is suspicious and we wonder if she had something to do with it. It turns out that the enigmatic Waldo is not so difficult to find after all. After we spent hours looking for him as children, combing the pages of books and pictures trying to get a glimpse of the red and white scarf, these two friends found him accidentally, in the background of their photo. They were just trying to get a memento of their tasty meal together but instead accidentally uncovered the true location of the infamous cartoon character. Nice work, guys. If you are a father, and you walk in on your daughter making this silly selfie pose, what do you do? There are some dads who will simply ignore it and continue on with their business, some dads who might try to engage their little girl in conversation, and then there’s this dad, who took the opportunity to make his own ridiculous face in the background of his daughter’s photo. No matter that he wasn’t even wearing a shirt, he struck a pose, and made this picture pure selfie gold. The person who took this picture accidentally captured something very strange and unexpected on camera. 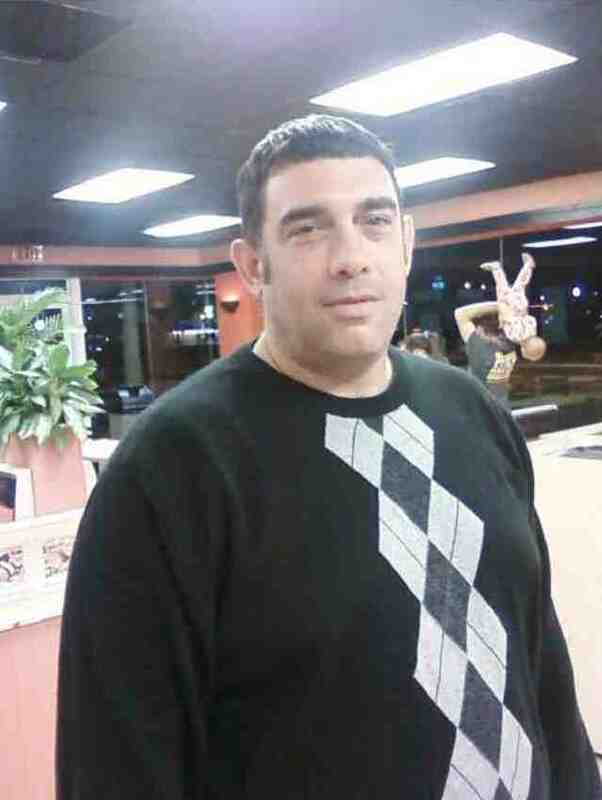 At first glance, it just looks like a nice picture of a man at a fast food restaurant, but if you look a little more closely you can see something concerning going on over his shoulder. There’s a person holding a child upside down over his head! 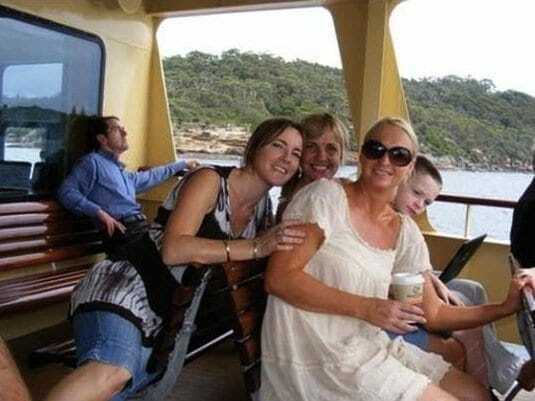 We don’t know what’s going on there but we hope the kid is just enjoying the ride. Two friends were photographed playing an innocent game of beer pong, but when they looked back at the photo later, they discovered something that they never expected hidden in the shadows. 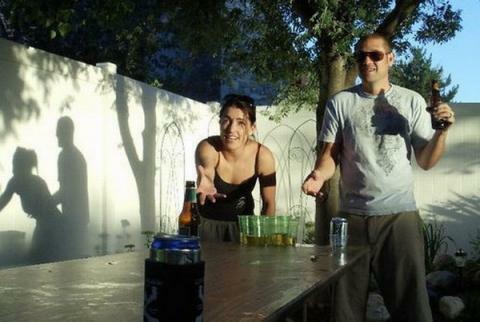 Somehow, the shape of their bodies and the angle of the sun at the moment that the picture was taken created a shadow that made it look like they were doing something completely different than playing beer pong. It just goes to show that even photographs can be deceiving. As we have already seen, taking pictures near mirrors can be challenging, because the mirror reflects back what is really going on behind the camera. In this case, the picture in the mirror reveals the photographer, who might not be the person you would expect. 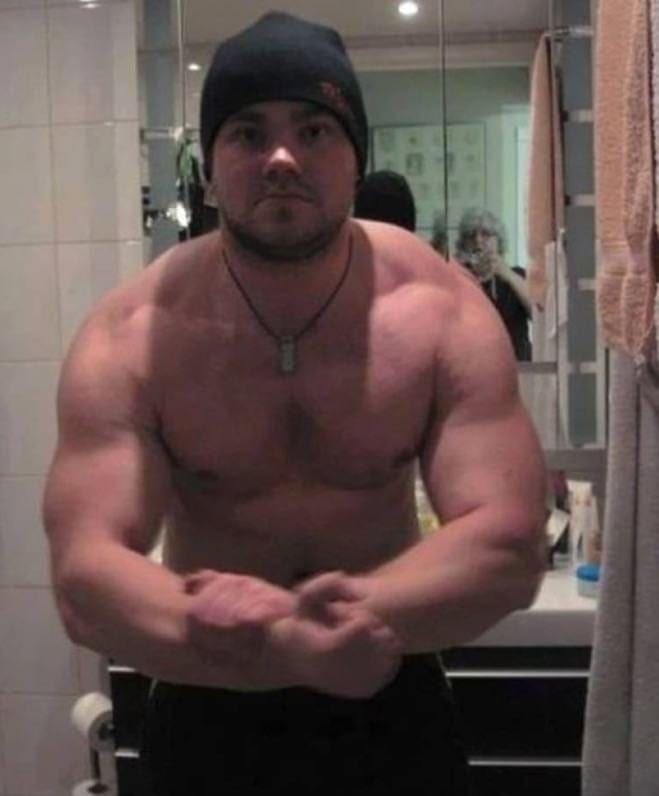 This bulked up guy wanted a picture showing off his muscles, and he seems to have asked his mom to take it. Not your usual choice but we think it’s pretty sweet. When this family leaned together for a picture during a boat ride, they didn’t even stop to think about the man sitting behind them, because why would they. Only later, when they saw the picture, did they realize what had happened. Due to the angle of the seats and their bodies, the man’s legs blend into the woman’s shirt, making it look like he is actually a tiny man, sitting on top of her. With his hand on his hip and his face to the sky, the illusion is complete. 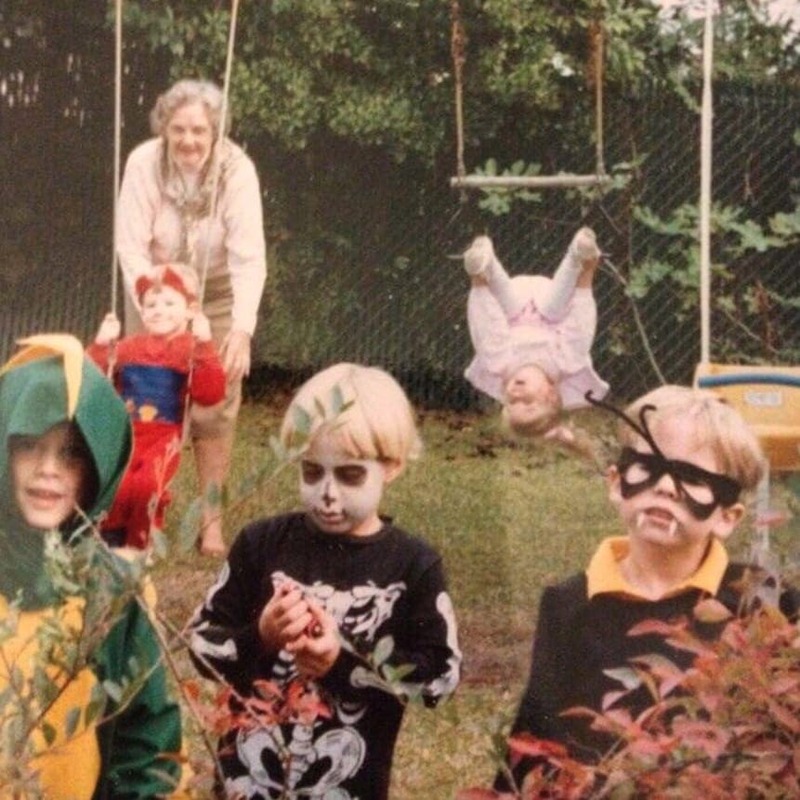 These kids look like they’re having a pretty good day, all dressed up for Halloween and playing outside on the swings. However, it can be tough for just one teacher to pay attention to all of the kids, even under the best circumstances. While the teacher pushes one kid on the swing, the little girl next to him seems to have forgotten which way is up, and the priceless and adorable yet slightly scary moment was captured on film. There’s nothing like a nice cold ice cream cone on a hot day. 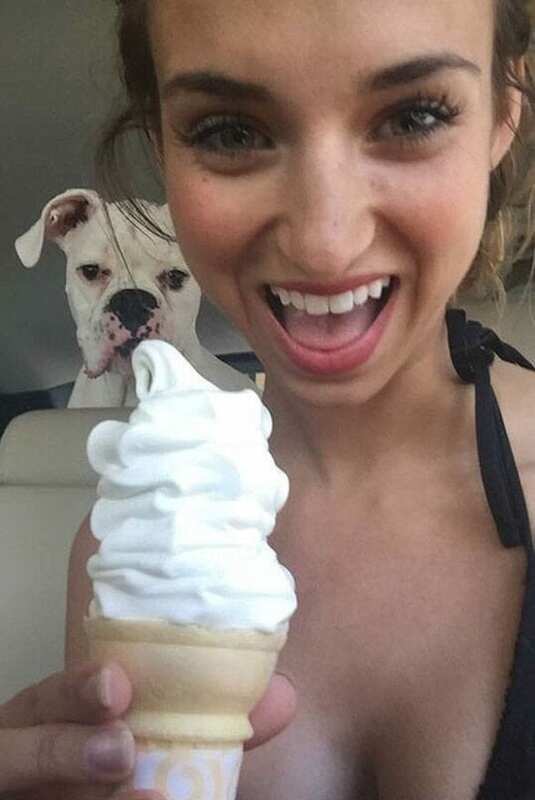 That seems to be the message that this girl is trying to send with this ice cream selfie, and the dog in the back seat seems to agree. It is making a very funny face that is the epitome of jealousy – it wants some too, and to be honest, we understand that feeling completely. What would have been a pretty vanilla selfie turned into a hilarious dog photobomb. 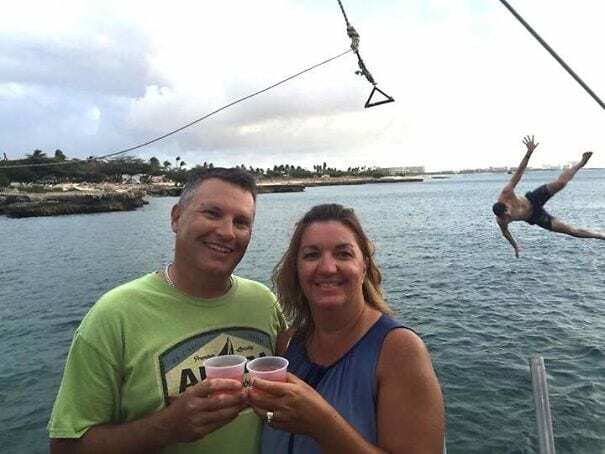 While nobody wants a stranger to photobomb their wedding pictures, we firmly believe that the guy in the background of this photograph actually made the picture even better. The couple chose a beautiful location for the photo shoot, with the white walls and the water in the background. But then, a ninja jumped across the top of the picture at just the right moment. 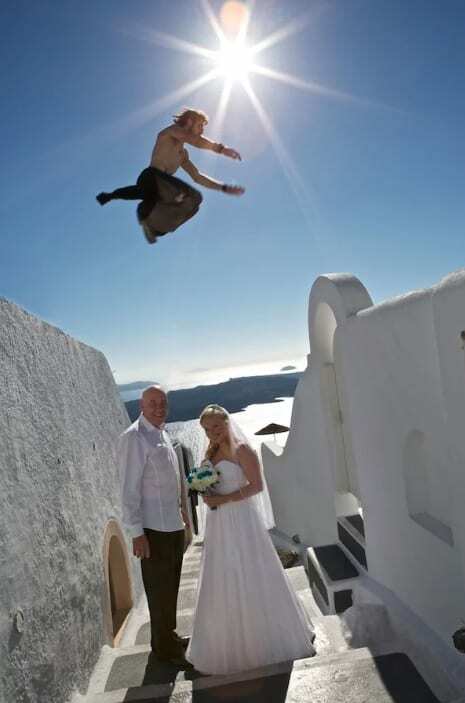 It’s really quite impressive, and it makes the picture so much more unique than your run of the mill wedding photo. 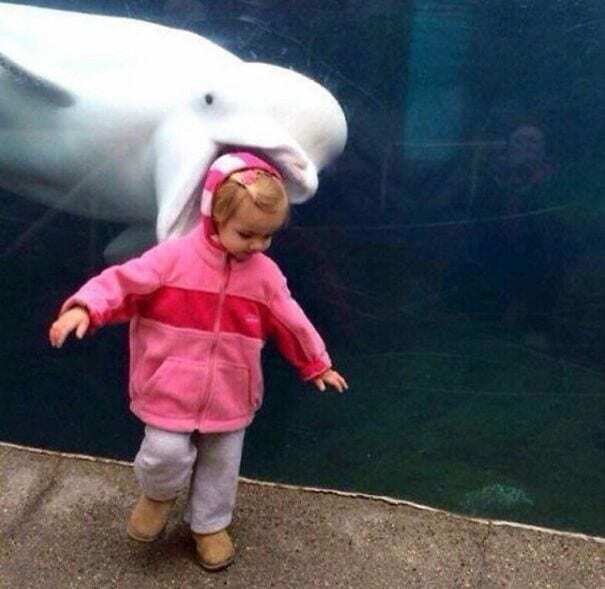 It was just a regular family trip to the aquarium, when this child’s parents decided to take a nice picture of her in front of the beluga whales. One whale had other plans however. Just as the photographer pushed the button, the whale opened its mouth as if to eat the small child’s head. Luckily we know that there is a layer of glass between them, or this picture would be scary. The timing really is impressive, though, and the beluga is the real star of this photo. In our humble opinion, this photograph is a masterpiece. 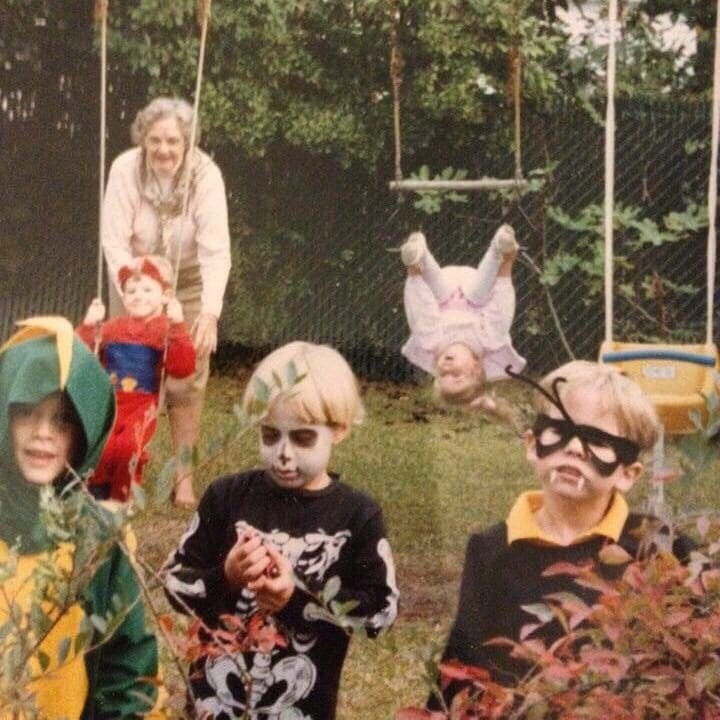 One photobomber just wasn’t enough here – an entire family made the background of this picture into something amazing. A family of four was sitting at a restaurant and decided to take a nice family picture. But there were only low dividers between the booths, and the family sitting behind them noticed the camera. Somehow, they quickly got into perfect formation and posed for the photo. It’s truly genius. Times Square in New York City is one of the most popular tourist destinations in America. As such, there are plenty of characters who walk around, waiting to take photos with people. They usually don’t get into any altercations, but in this case, it seems that something’s going on with Elmo. 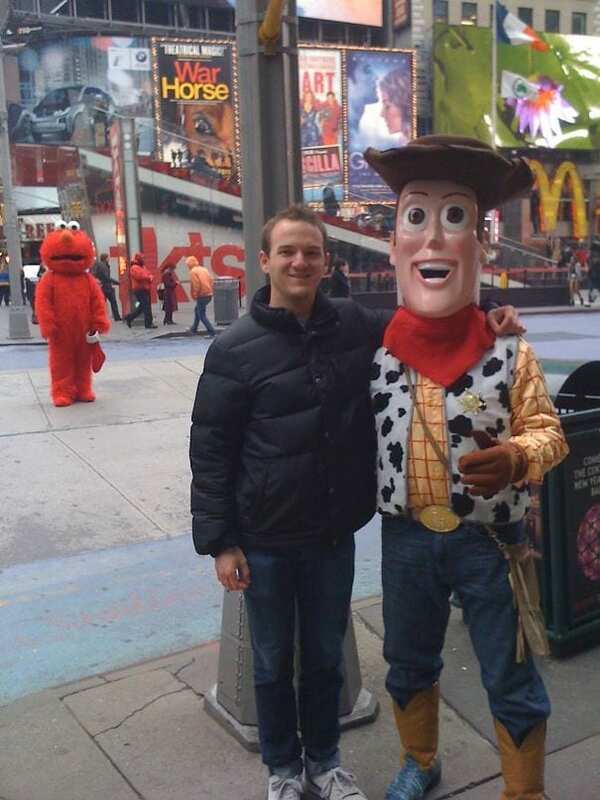 Maybe Woody’s charm is getting him more pictures than Elmo, or maybe Elmo and Woody had a thing going on… we’ll never truly know. But Elmo’s sad, longing look definitely steals the shot. 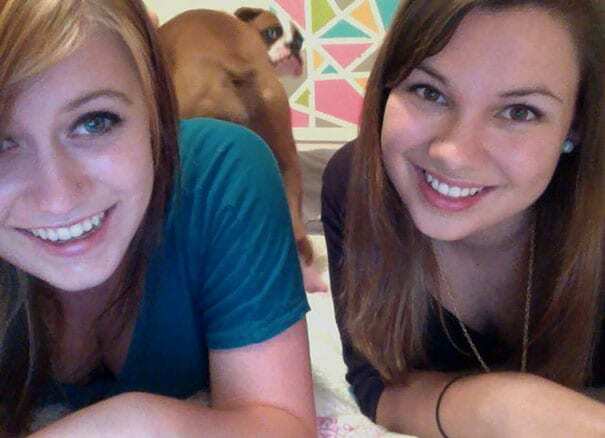 Animal photobombs are just the best. These friendly policemen were taking an on-the-job selfie, as they do, but the horse behind them decided that it wanted in on the action. Not only did it stick its head right in the picture (with perfect placement, we might add), it gave the camera a big ole horsy smile. 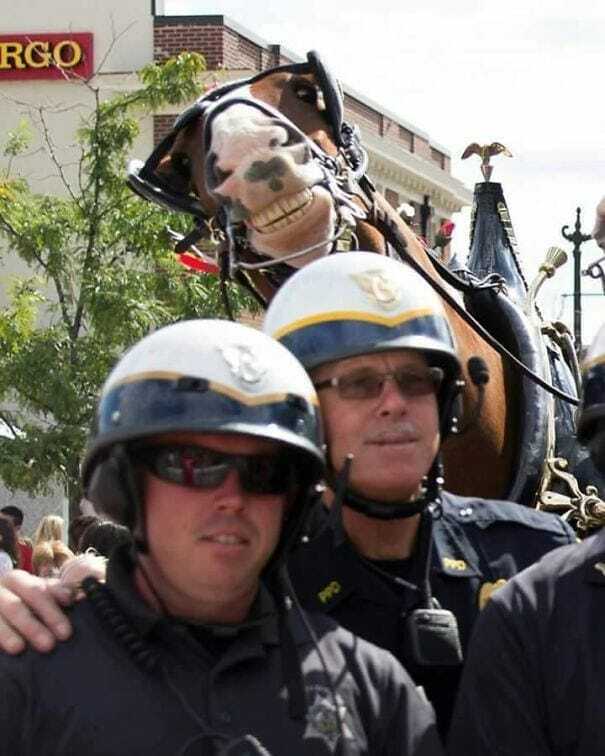 What would have been a simple selfie turned into a hilarious picture of two cops and a very happy horse. At first glance, this picture appears to be a nice photo of four charming friends at a Vikings football game. But look closer – do you see what we see? The boy sitting a row back noticed the camera and reacted appropriately, effectively taking the focus away from the women. We give him a lot of credit because anyone who manages to steal the scene from these very good looking young women truly has a special talent. When your parents are on vacation, they’re bound to want a nice photo to frame on the wall when they get home. And that’s what they were trying for here, with their big smiles and cold beverages. Unfortunately, they forgot that there was a rope swing behind them, and happened to time the taking of the picture at exactly the moment when a guy tried – and failed – to do a flip. All we can think when we see this picture is: that one’s gonna sting! 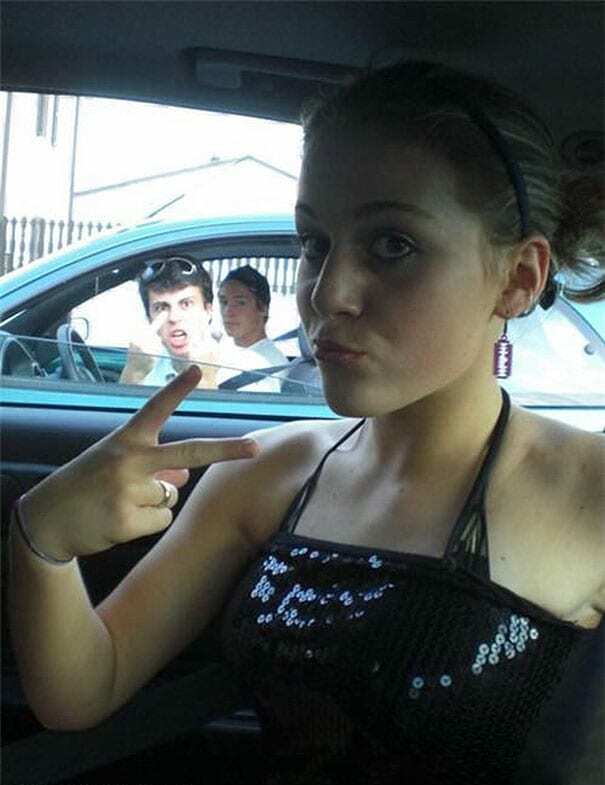 These lucky girls caught more than they expected in their selfie. Queen Elizabeth herself was in attendance at the 20th Commonwealth Games, in Glasgow, when she decided to prove what a cool lady she really is. 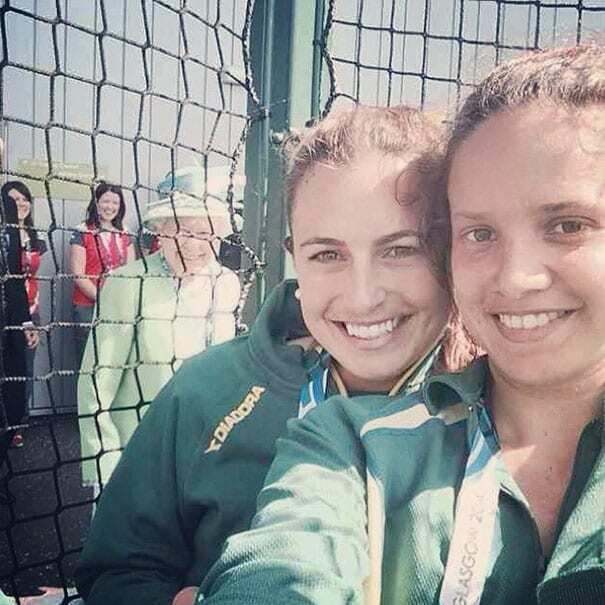 She saw two young Australian hockey players taking a selfie in front of her, and she gave them a winning smile. The hockey players were thrilled to see the Queen of England herself in the background of their picture, and posted it immediately on Instagram, of course. 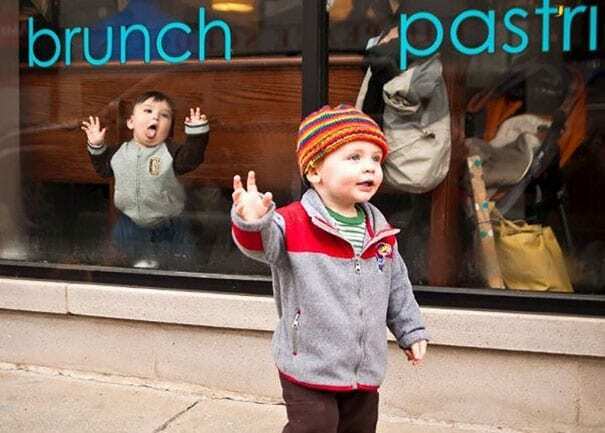 Even though the baby in the window is probably too young to know exactly what he is doing, he is somehow perfectly photobombing a picture of another small child. The photo is clearly being taken of the kid in the front, the one with the orange hat, and it would have been a pretty nice picture for his parents to show off, if the other baby hadn’t gotten involved. For some reason, he squished his little face on the window of the cafe in the background, tongue and all. When you go to a butterfly garden, you should probably expect to come across some live butterflies. As far as we know, that’s the point of the place. 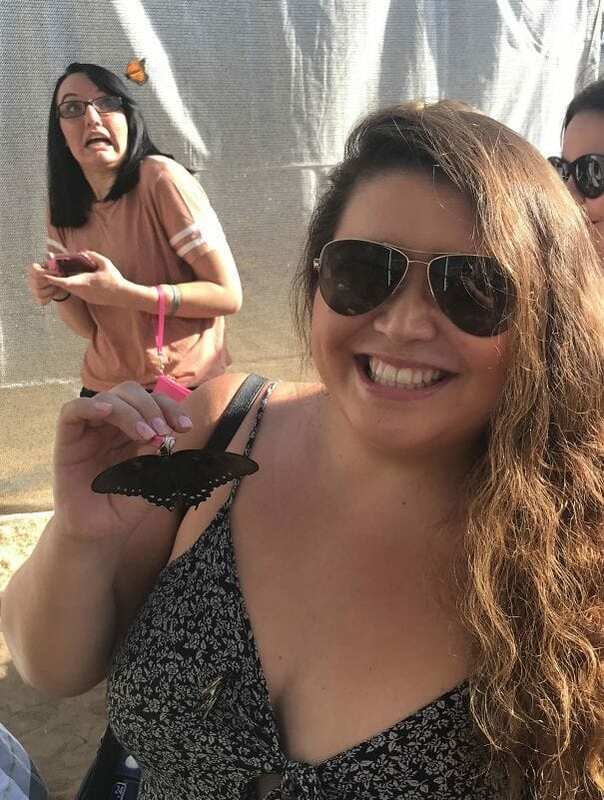 The girl in the foreground of this picture seems to understand that reality just fine, and looks like she’s enjoying her time with the butterflies, even posing happily with one. But behind her, there’s a woman who is definitely not on board with the concept. A butterfly is coming towards her and she just looks terrified. 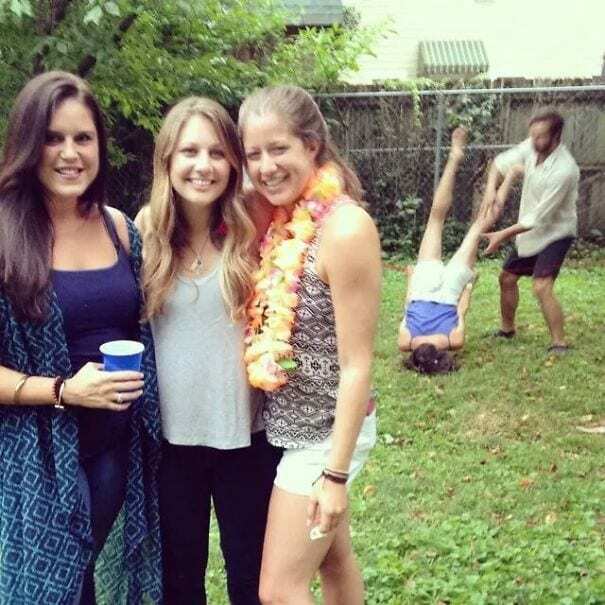 A lovely picture of three good friends turned into something quite a bit darker when the guy and the girl behind them decided to try their hand at acroyoga or something. They were clearly not properly trained for whatever they were attempting to do, and the young woman went crashing down on her face, just as the photograph was taken. We hope she’s okay but we also aren’t ashamed to admit that the picture made us laugh quite a bit. When photographing sporting events, you have to always be prepared to snap the perfect action shot. This photographer did just that, although we have a sneaking suspicion that it was by accident. 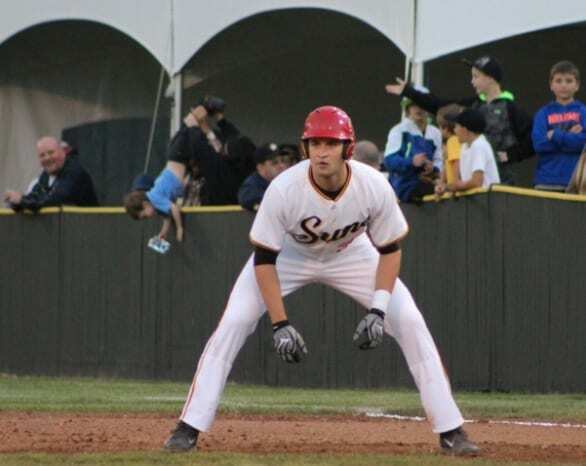 He was waiting to catch this baseball player in motion, but the real action was happening in the stands. For some reason, someone decided to lower a child head-first over the fence. Maybe he dropped something and was trying to retrieve it, maybe he was just goofing off – either way, it certainly takes the focus of the picture. Sometimes, you want to take a nice selfie with your bestie, but you have to get the conditions just right. First you try outside but it’s too sunny. Then you try in your room but the angle is off. So you finally lie down, frame the picture just right, and then your dog photobombs the shot. We think this dog knew exactly what it was doing when it turned around and looked directly at the camera. A parent took a picture of their child during a visit to their classroom. At first they thought they had just captured a regular picture, but then they looked closer and saw something pretty surprising in the background. There is a child’s head just resting upside down on the ground! The kid doesn’t look particularly concerned, so we aren’t either. But it raises a lot of questions about this particular classroom and what exactly is going on here. This woman took a selfie at a baseball game, when perhaps she should have been looking around her. She chose just the wrong moment to look away from the action, and a baseball came flying at her head. In the picture, she’s smiling brightly, clearly with no idea what’s about to happen to her. It really made for a fascinating picture that we couldn’t recreate even if we tried. That one probably left a mark, but we hope she wasn’t hurt badly. For anyone who didn’t watch the 2019 Golden Globe awards, allow us to tell you that the biggest star of the evening was an unlikely one. A model by the name of Kelleth Cuthbert seems to have completely stolen the show, even though she was only there to hand out Fiji water bottles. The young woman managed to photobomb almost every single picture taken that night and was caught posing with celebs such as Nicole Kidman, Amy Adams, and Kaley Cuoco. Needless to say, she got everyone’s attention.